Blueberries were on sale this week at the grocery store I shop at. I picked up two pints with thoughts of making blueberry treats on my mind. Blueberry Sweet Rolls and White Chocolate Blueberry Bars were on the list. And the latter of the two was made Sunday evening. I’ll be sharing that recipe later this week and I’ll be making a batch of the blueberry sweet rolls this weekend. I needed to make a filling for the bars and the sweet rolls. So I made a super simple batch of blueberry preserves. I skipped the canning process since I made a small batch (filled 2 pint jars) of preserves that will be used up within two weeks. Plus, I am not a fan of canning. Great concept, too much hassle for me. It’s funny, I will spend the time making an elaborate recipe but when it comes to canning, you can count me out. Four ingredients are all you will need for this recipe. And about 15 minutes of time. It’s really that simple. 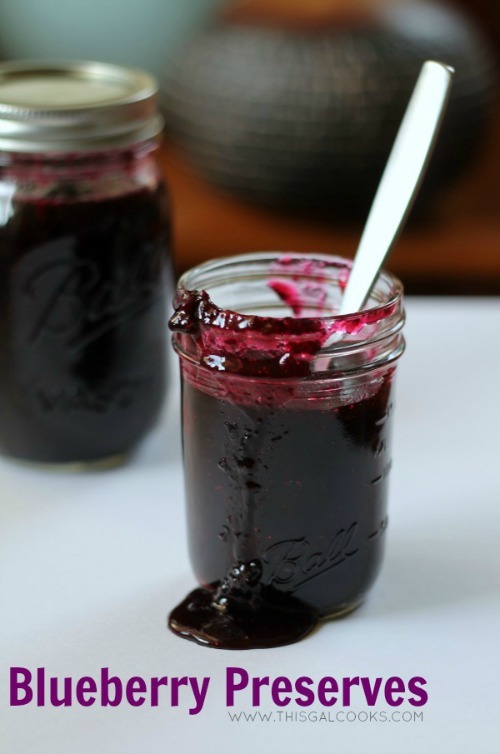 Use the preserves for sandwiches, bars, muffins or sweet rolls. You could also top some vanilla ice cream with them. Mmmm. I hope you enjoy this recipe! In a large pot, bring the mix together the sugar and blueberries. Bring to a boil. Boil for 3-5 minutes or until the blueberries are soft and easy to smash. While the mixture is boiling, smash the blueberries. I don't have a fancy smashing tool so I used the bottom of a hefty glass. Add lemon juice and pectin. Mix well and reduce heat to a simmer. Simmer for a few minutes or until slightly thickened. Remove the sauce from the heat. Transfer to jars and refrigerate for up to two weeks. « Previous PostIt’s My SITS Day! I’m in awe! Really. These are gorgeous and I’m sure they’re even tastier. Enjoy your SITS Day! Loving this, Julie! Can’t wait for the sweet rolls and bars! 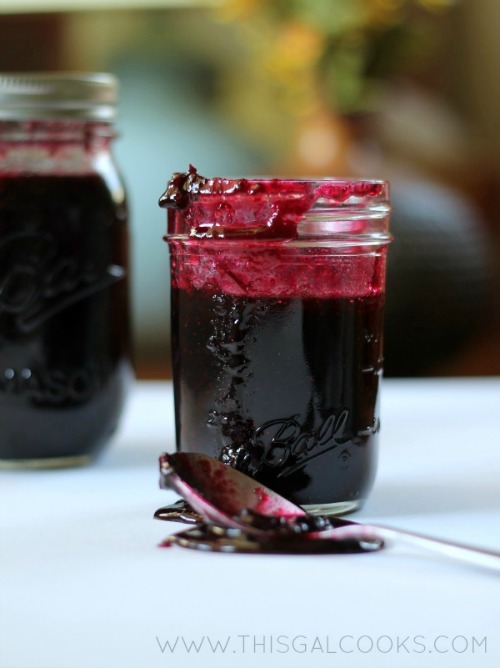 Can’t wait until I can make my first batch of jam for this season – it’s still too early here. Yours looks delicious. 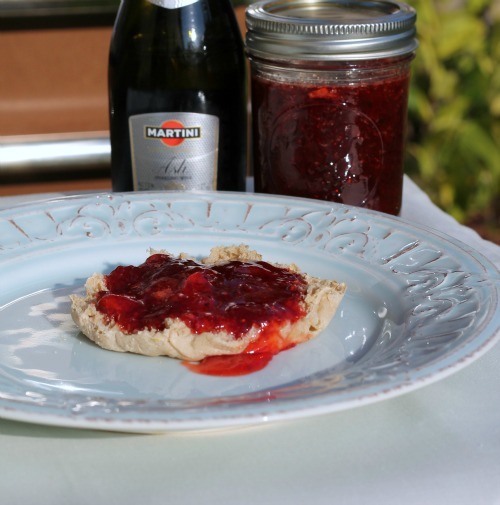 Can’t wait to try a champagne jam – I might try champagne / cassis. Yum! Looks yummy. We enjoyed blueberry picking last year and hope to go again next month so I will need some recipes. I didn’t like canning the one time I tried it with my sister either, it was an all day project and a lot of work! Canning scares me because I’m afraid of not doing it properly and giving our family botulism. I didn’t think of making preserves and just using them right away. Your recipe sounds so easy, so I will have to try it! Julie, this looks wonderful and I never realized it could be so easy!! Thanks for sharing and have a fabulous evening! Yum! I haven’t made my own blueberry preserves yet but baked with some store-bought preserves the other day and know that this homemade version would be delicious. Love this! Happy SITS day!!! 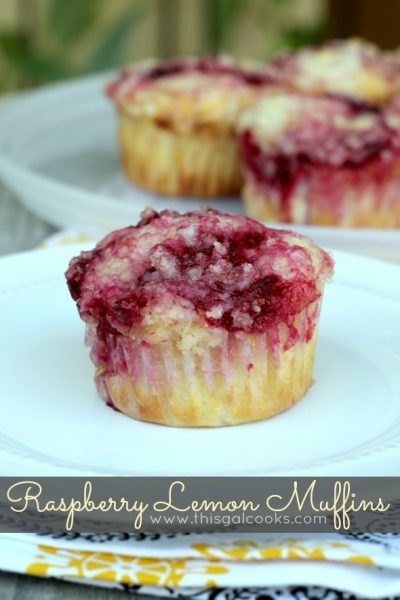 The lemon raspberry muffins look great! This looks so good! I’m not a fan of canning either. Can’t wait to try this! Perfect for the summer blueberries coming in!! Love this, Julie! Pinning! Very yummy looking and perfect for summer… Pinned! I like the picture too! 4 ingredients and 15 minutes??? Well, shoot, how can I NOT make this! Plus homemade preserves taste so much better! Great pictures too. 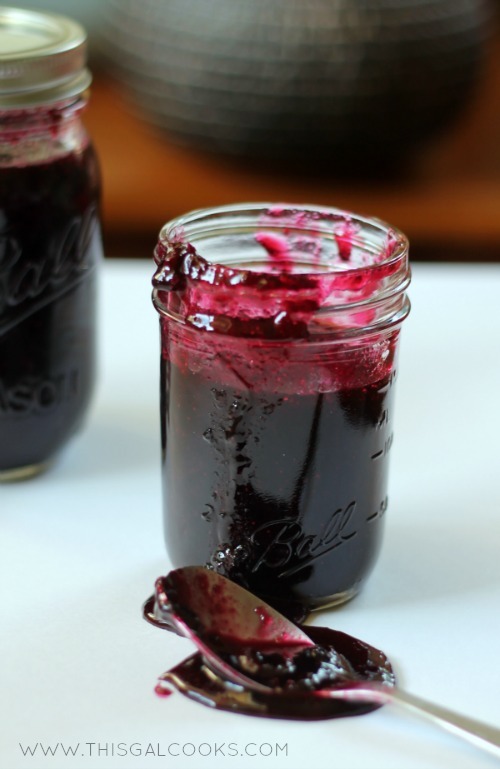 Beautiful photos – The Husband loves blueberries so I can’t wait to make this. Pinning!! We are so on the same page- I just made blueberry marmalade yesterday. It’s so good with so many things. This looks delish. How much does this recipe make? Did you use powdered pectin or liquid? Oh, and one more thought. If you have a potato masher – that works. Those blueberry lemon muffins look incredible. Actually, it all looks incredible. I love blueberry anything! My tummy is literally grumbling! lol. This looks terrific! Thanks for sharing! You’re very welcome, Jamie! Have a wonderful day! With 3 gallons of Blueberries sitting in my kitchen right now, I’ll be making up a batch of your preserves in the morning! Julie, about how much preserves is made from the listed amount of blueberries? (I’d like to just make enough to make the blueberry bars…so 2 cups. wondering if i can make a partial batch.) thank you! i love this site! Hi Lindsay! I made about 2 pints of preserves with this. You could always cut the recipe in half and get about a pint of blueberries! If you have any left over, just use them on a sandwich, toast or over yogurt. You could make an excellent yogurt parfait with them! Thanks for stopping by and have a wonderful day! Want to try these preserves to make with the Blueberry coffee cake muffins. Looks so good! Just wondering – how long do you boil the blueberries? Also, I’ve never used pectin before. Is it liquid or powder? Thanks very much! Boil for 3-5 minutes or until they are easy to smash. I updated the recipe to include that. Pectin is a powder. You can usually find it in the same area as pudding and gelatin in the baking isle. Let me know if you have any other questions!